After establishing the first missionary station in Kashgar in 1894, three other missionary stations were opened in the region. In 1896 a station was opened in Yarkand, which was followed in 1908 by a facility in Hancheng. Finally, in 1912, a fourth station was opened in Yengi Hissar. All of these stations, except the aforementioned mission in Hancheng, which was devoted to the Chinese, served the Turki speaking population of Xinjiang. There existed plans to open stations in Khotan, Aksu and Kuchar as well. 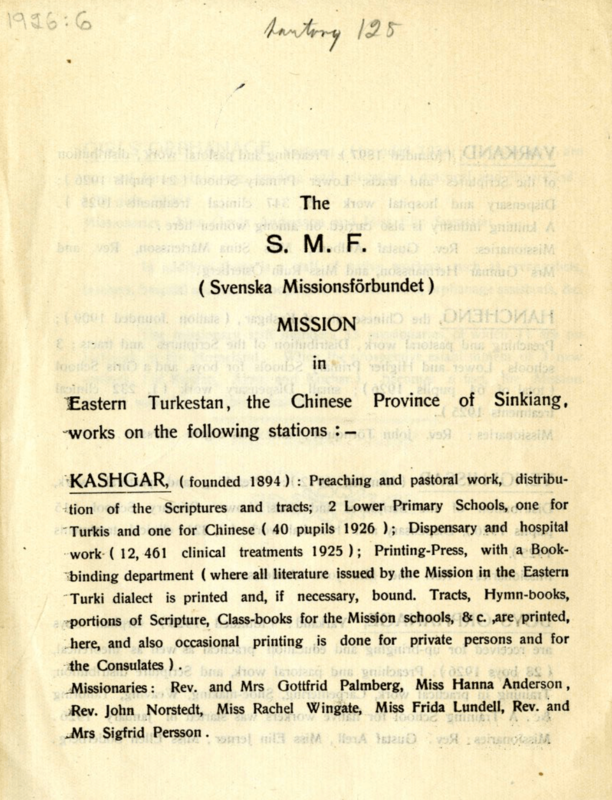 The publication 1926:6 contains information regarding these plans: “The missionary staff numbers 33 missionaries, of which 11 are on furlough in the Homeland. When the prospective establishment of 3 new stations (at Khotan, Aksu and Kuchar), becomes a fact, the mission should want 7-8 more missionaries”.